Two historic churches representing two distinct segments of Lowcountry society. This journey through the past begins just outside of Pritchardville at St. Luke’s Methodist Church. Originally a parish of the Anglican Church, St. Luke’s was authorized by an act of the Colonial Assembly in 1767 and built in 1786 on land donated by prosperous planter John Bull. Today, it stands as one of the oldest surviving frame churches in South Carolina and is architecturally significant as a representation of the transition from early, Georgian-style Episcopalian to Greek Revival. Named to the National Historic Register of Historic Places in 1987, it also has one of the only intact church slave galleries in the state. Cross above the pulpit, recycled from the original slave gallery wood railing. On a tour of the grounds, church historian Betty Forristall points out the cross above the pulpit, recycled from the original slave gallery wood railing, as well as the tomb of Mary Bull, wife of Colonel William Bull of Sheldon, who “departed this life after a painful illness” on November 3, 1793. Other significant gravesites include those of famed botanist and Confederate Army surgeon Dr. Joseph Mellichamp, as well as 11 Confederate soldiers (two of whom served with South Carolina’s own Kirk’s Partisan Rangers), 43 other veterans who served in both World Wars, Korea and Vietnam, and those whose family history is intricately interwoven with that of the Lowcountry. During the presentation and tour, docents will be on-site to provide brief biographies of those buried at St. Luke’s, followed by refreshments in the Fellowship Hall. 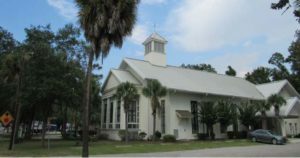 Revival-style church on Boundary Street was built in 1853 and was originally the Bluffton Methodist Episcopal Church. 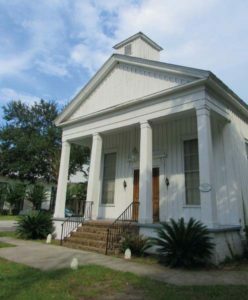 The oldest church in Old Town—and one of only two that survived the Burning of Bluffton by federal troops in 1863—the congregation consolidated after the Civil War and passed the building on to nine former slaves: Renty Fields, Jacob Chisholm, William Ferguson, Jeffrey Buncombe, William Smith, David Heyward, Christopher Bryan, Theodore Wilson and William Lightburn to form Bluffton’s African Methodist Episcopal Church. Although details are unclear as to why a white congregation would turn their church over to the freedmen and little is known about these former slaves who took it over, research has indicated that at least one of the men, Jacob Chisholm, had been a slave of a previous trustee. Native Blufftonian Nate Pringle, president of A Call to Action (ACT) and board member of Celebrate Bluffton, has a vested interest in learning more about the history of Campbell Chapel A.M.E. and restoring the church to its former glory, as he is a descendant of William Lightburn, one of the nine founders. 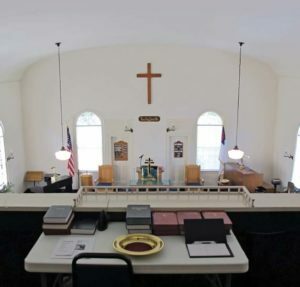 Although the congregation outgrew the original building and moved to a new church next door in 2004, efforts are currently underway to have Campbell Chapel A.M.E. listed on the National Registry of Historic Places, obtain funding for its preservation and eventually restore it for use as a community center. Celebrate Bluffton’s Executive Director Carolyn Coppola has been instrumental in researching the church’s history and evaluating its historical integrity, with the help of Savannah College of Art and Design students. Boasting an unusual application of board and batten siding, the church has expanded throughout the years, including a small addition on the east wall in 1874, with a second addition constructed around the first in 1957. The current configuration was established in 1966 with the construction of an annex. These additions most likely conceal important historical features and materials which are slowly being uncovered. The church bell was recently located and rang again in 2015 in honor of Campbell Chapel’s 141st anniversary, as well as in memory of the nine murdered at Emanuel AME Church in Charleston, including South Carolina State Representative and Mother Emanuel Reverend Clementa Pinckney, who served as the pastor at Campbell Chapel from 2009-2010.